Is the world ready for another layer? While there is general agreement that the technology behind the World Wide Web is quickly becoming too limiting for everything we want to do online, how to fix those limitations remains a wide-open battle. With the various standards-setting bodies debating over whether to replace HTML with the more powerful XML or simply rev up HTML with more extensions (both are likely to be incorporated into the next generation of Web browsers), a French company has decided to bypass that whole morass by creating its own Internet layer. The frogans layer, which went live this week, proposes to allow new content to appear side by side with Web contents  a concept the frogans web site calls "parallel surfing." frogans' markup language doesn't create a replacement for Web pages; rather, it creates what the frogans' folks call slides but which are more like small pop-up windows. From the screenshots at the frogans web site, it seems these slides at least have the benefit of not appearing in a standard Mac or Windows window, and can have any shape or outline. Within these slides is the information you want to display  most of the examples on the Frogans site show the slides being used as pop-up advertising affiliated with commercial web sites. The other part of frogans that can either be a great strength or a debilitating drawback is the fact that to publish frogans slide you have to have a frogans address. Similar to a URL, this frogans address costs about the same as your own domain, too  $80 for two years. While the frogans addressing system is less limiting than the current Internet domain name system, the only purpose of having it seems to be to generate income  there's no real technological reason that frogans couldn't have ridden on top of the current domain name system. But it's hard to see that a lot of businesses are going to pay out good money for an online address that can be found only by those who have the frogans player  at least until a lot more folks have downloaded and started using that player. Which brings up the core issue here  the difficulty that frogans, as well as the other types of Internet protocols being developed, is going to have in catching on. No one will download a player if there's no content; no one wants to develop content until there's an audience. It's a tough Catch-22 made all the tougher given the massive inertia behind the existing World Wide Web. A few years ago, there was a lot of hype behind a new Internet layer that allowed visitors to add their comments to a web site  without the site owner's permission. However, you needed special software to write your comments or read those of others, and while it may still be around, it never caught on with the general public. 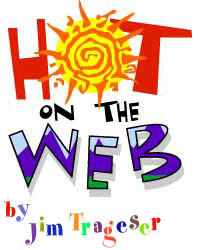 When Tim Berners-Lee developed HTML  the code behind the World Wide Web  in the late '80s, most folks had never been online and there was no standard graphical environment for the Internet. Berners-Lee's development may not have been the first graphical interface for a hypertext system, but it was one of the best and quickly became the accepted standard. Back to frogans  it's an original idea, clever and creative, even fun. It's still unlikely that all that is going to be enough to get the world to accept another markup language  FSDL  and another viewer. Unless the folks at frogans can get AOL and Microsoft to buy into their concept and include the frogans player in their IE and Netscape browsers, frogans is facing one tough road.